Update files that have changed in your Dropbox account. If you have used Dropbox to import your files on a different device this feature will be applicable to you. Even if you used Dropbox on an Android device. To start “Update Dropbox Files” go to the songs page. 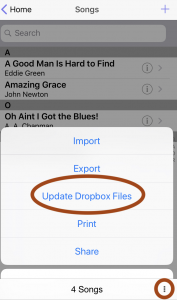 Tap the 3 dot menu button in the bottom right and select “Update Dropbox Files”. 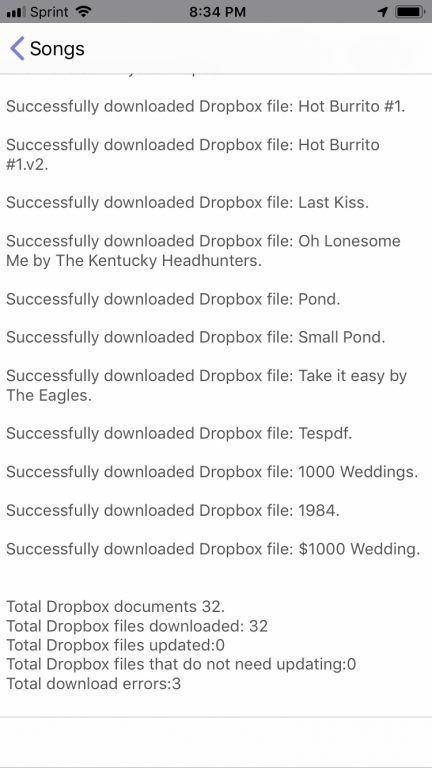 When you tap Update Dropbox Files a view will appear to show you the status of what is being done. This view will show you what files have been downloaded, updated, or any errors that occur.